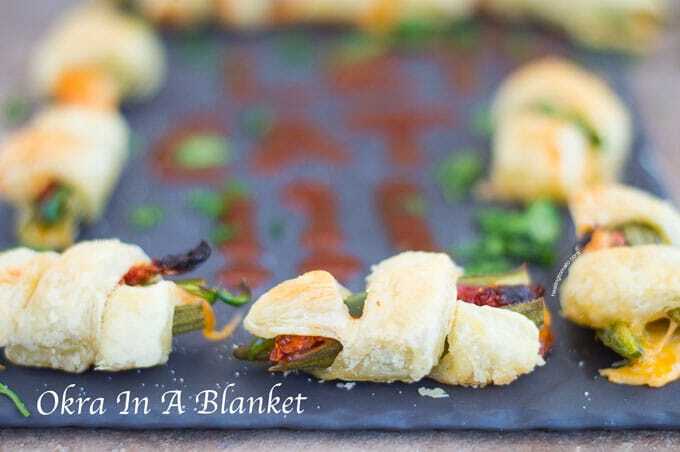 This Okra In A Blanket is a vegetarian take on the classic pigs in a blanket! It’s filled with ooey gooey cheesy goodness and wrapped in a warm pastry blanket. It’s the perfect game day or tailgating appetizer that everyone will love! How often do you get to serve an okra recipe to your football fans? 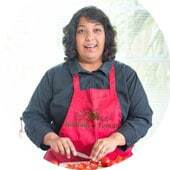 An okra recipe that they can really drool over? Maybe this might even get them to fall in love with okra? Ok, I might be a little too optimistic in saying that, but, I am sure that they will love this recipe. Anything that has gooey melted cheese in it is irresistible, especially to game day guests! Cheese is practically a requirement at all my game parties. 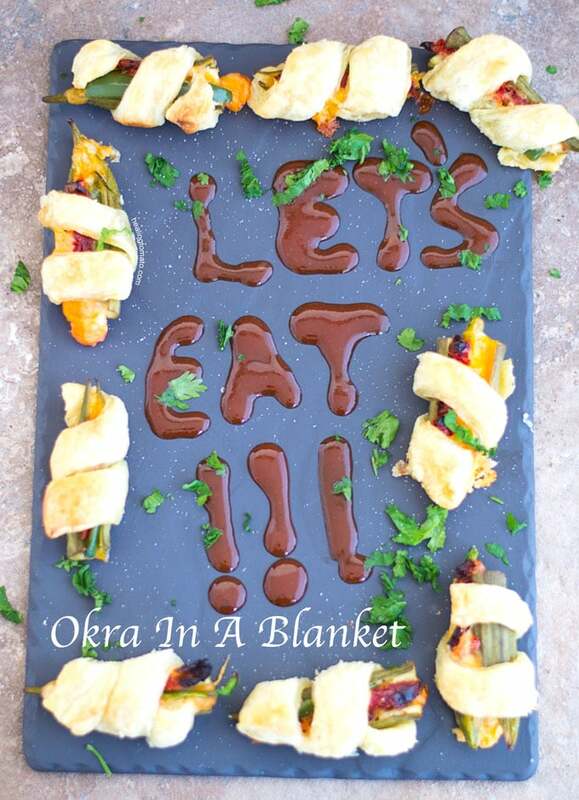 For this okra in a blanket recipe, I didn’t use just any ordinary cheese. I was at Publix on one of my infamous evening trips where I scout for new products. 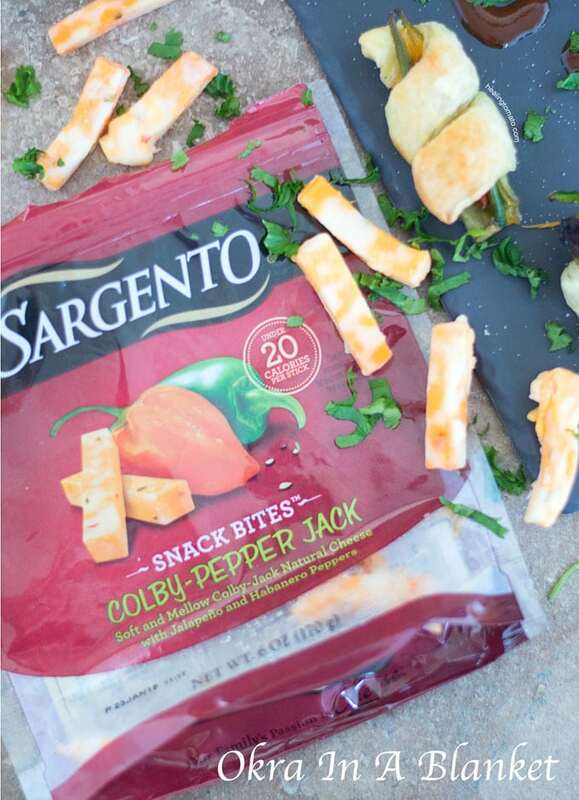 This time, my eyes were drawn to Sargento® Snack Bites®! I think these bites were MADE to be put into okra! Their size is perfect to fit into okra. They have just a little bit of pepper to offset the okra. Add sun-dried tomatoes to it and you have a delicious blend of tang and spice. These snack bites are part of Publix’s “$24 of Savings” program that begins January 20th. You can purchase this and other products from their site and get a total savings of $24! Don’t you just love saving all that money? I love hearing about deals at Publix! Whenever game day rolls around, I am always looking for deals that will help me save money. My guests always come to my parties with empty bellies! If you are taking this to a tailgating party, they hold their shape very well. I tie them with a ribbon of puff pastry before baking them. The ingredients fit snugly in the okra and are embraced in the warm comfort of the pastry ribbon. Aren’t you curious to see what other products are part of their “$24 in Savings”? You are in luck because they have a website which lists them all. I can see at least 4 products that will come in handy! 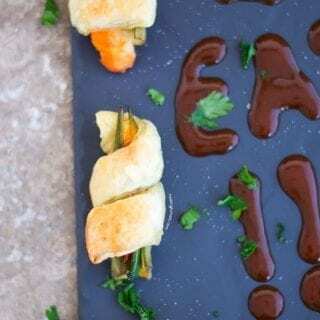 I served these okra in a blanket with a sweet sauce, but, they will work great with ketchup too. I even dipped one in tahini sauce and it was so good!! What is your favorite way to eat okra? 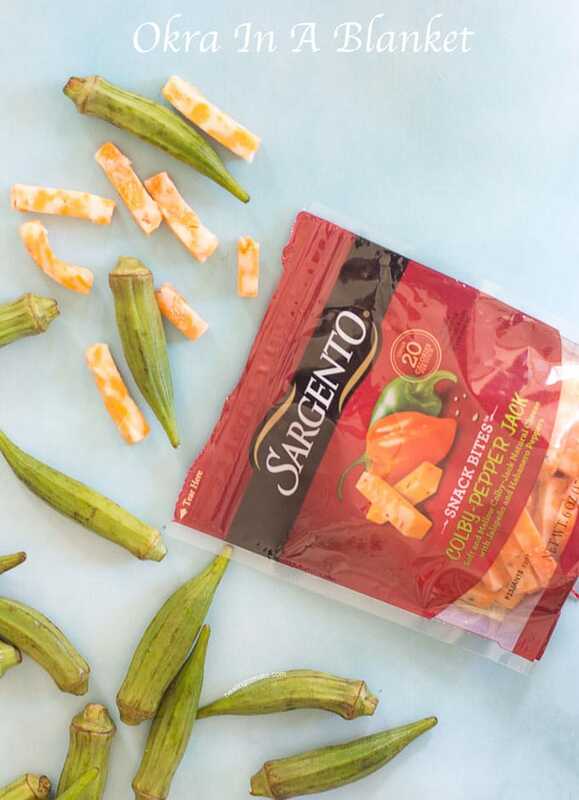 1 Packet Sargento® Snack Bites®! Cut the heads of the okra and make one slit, lengthwise. Don’t split the okra into 2 parts. Remove as much of the inner contents as you can. The seeds are not harmful, but, you want to make space for the awesome ingredients. Place them on a baking tray and lightly spray with cooking spray. Place in the oven for 15-20 minutes to soften them. When they start to brown a little, remove them from the oven. Turn the temperature of the oven up to 400° and let it heat. Wait for the okra to cool completely before filling them up, otherwise the cheese will melt in your hands. While they are cooling, make strips out of puff pastry. First, cut the sheet in half and then make ribbons out of them (I went with ½ inch wide by 5.5 inches long - It doesn’t have to be exact). Cut the jalapeño into long strips and set aside. Gently open the okra and start by filling with 1-2 cheese strips. Add one jalapeño strip to the side of cheese. Top with about 2-3 sun-dried tomatoes. Wrap the stuffed okra with one of the pastry strips. Place the wrapped okra on a lightly greased baking sheet. When done, lightly brush the tops of the pastry ribbon with the melted butter. Place in the oven and heat for 10 minutes or until the tops of the pastry have browned. Some of the cheese will melt outwards and that’s ok. Serve with a hot sauce or ketchup. What is not to love here?!! Roasted okra, melty cheese with spicy jalapeños? 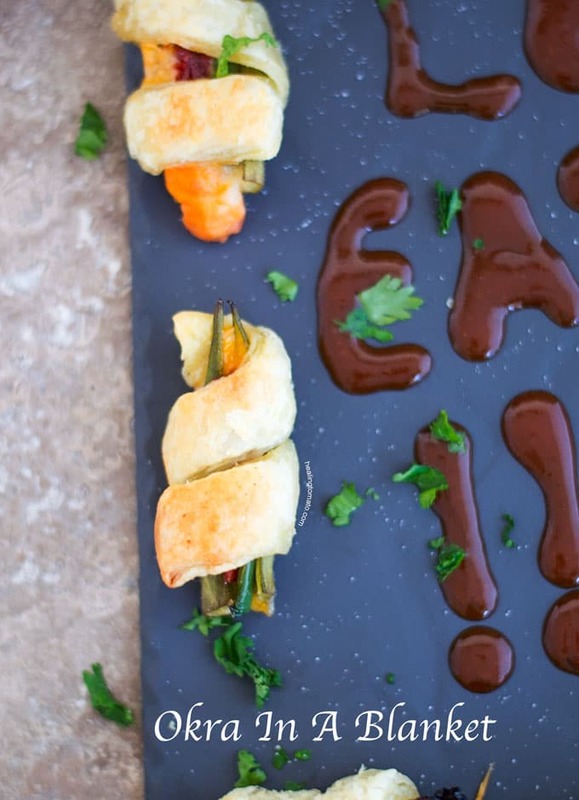 These sound super yummy all wrapped up in puff pastry, how yummy and great game day food!! !